When lake fishing getting your lure down to the trout is half the battle. A downrigger is a device used to achieve this aim. Porta-Bote fitted with a Scotty Lake Troller. 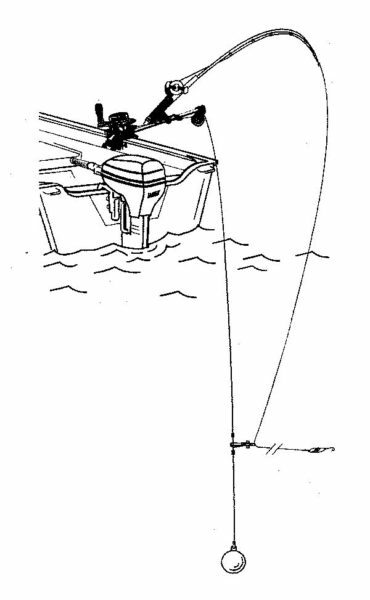 The downrigger is mounted on the right (starboard) side of the transom as far away from the propeller as possible. Also, note the spread between the two-rod tips which helps to reduce tangles. It is quite possible to troll with the aid of a downrigger while rowing. Indeed this is a very effective method of catching trout and landlocked salmon on many lakes. 1. Downriggers allow fish to fight freely on an un-weighted line. This is the biggest advantage of down-riggers over lead core lines and sinkers; once the fish hits your lure, it pulls the line free of the downrigger clip and is then able to put up a strong fight on your light monofilament fishing line. Lead lines, on the other hand, tend to sandbag the fish so that it puts up little resistance. I have found in the past when trolling lead lines that a strike from smaller fish can go entirely unnoticed until you wind in your line. 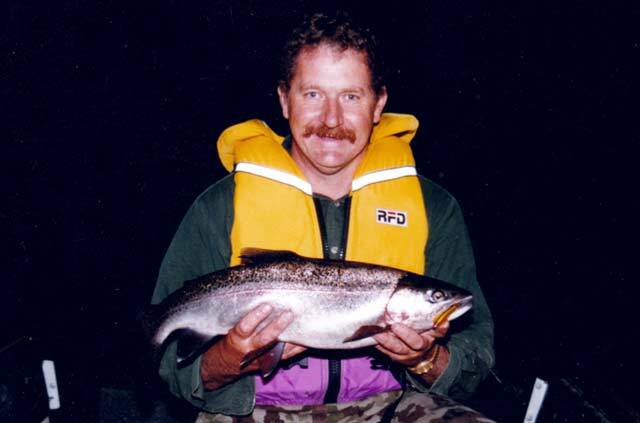 By which stage smaller trout can end up floating “belly-up” by the time they are brought into the boat and released. Typical Scotty Lake Troller set-up. 2. Downriggers can be used for trolling in conjunction with flat lines, lead lines, harling (trolling a fly line), or when trolling bibbed minnows and other lures, without your lines becoming tangled while turning, as they are prone to doing when trolling more than one lead line! If for example, you set your cannonball at 40 feet with your lure 30 feet behind it, other lures trolled on flat lines are going to be shallower and much further back behind your boat. 3. Down-riggers permit very accurate control over lure depth. When prospecting a lake you will often find the trout will appear on your sounder at a particular depth range. Let us say that depth is around 25 feet. It is possible to use the counter on your downrigger to set your lure, to exactly this depth. However, it is believed that trout are more likely to move up, or sideways to feed than they are to more down, and so in this instance, we would likely set the cannonball to say 22 feet. (b). The more line you let out the deeper the lure will dive. Most lures will run much deeper with 100 meters of line out than they will with just 30 meters out. There reaches a point where this rule no longer applies because the length of the line becomes so long that the effect of drag through the water causes it to rise. (c). Other factors including lure type and line diameter also have an effect on running depth. The thinner the line, the deeper the lure will run, and likewise the bigger the bib the deeper the lure will be inclined to dive. Therefore to set your Rapala to run at exactly 22 feet, you would have to make a series of calculations based on the following: exactly how fast is the boat moving; how much line needs to be played out; how to measure the line that is played out; these figures would be different for each lure in your tackle box! It would just be too difficult to work all this out, and not much fun either. With a straight-running lure on a downrigger, it is much simpler to accurately set trolling depth by reading off the line counter. Just how small and easy to manage the Scotty Lake Troller is can be seen in this photograph. The Scotty Lake Troller is a small light-weight down-rigger model designed for use on smaller craft. It is an excellent choice for use on aluminium boats, especially tinnies! It is available in both clamp-mount or bracket-mount versions. With the budget conscious in mind, the whole Scotty Lake Troller set, with a 3lb cannonball, costs only around $150 ready to catch fish (check today’s prices). This is the Scotty Lake Troller clamp-mount model. Though quite small it is amazingly effective. 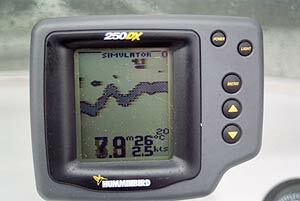 You often find that most of the trout caught in lakes are taken on the downrigger. The Scotty Lake Troller is made in Canada. Construction materials include engineering grade nylon and aluminium. To keep the price down on this budget model there is no line counter, but a quite accurate determination of cannonball depth can be gauged by remembering that one turn of the handle equals one foot of depth. I have tested the Scotty Lake Troller on a Porta-Bote. We were rowing the Porta Boat instead of using the motor. 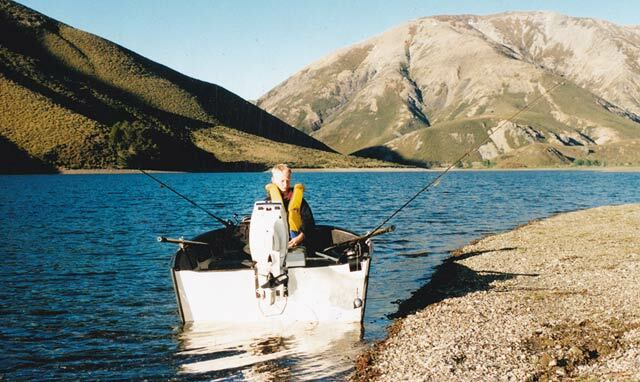 On some of Canterbury’s high country lakes, such as Selfe and Lyndon, the regulations only allow fishing from boats that are not being mechanically propelled. In other words, you are not permitted to use your motor for trolling. If you want to troll you have to row! A good sized rainbow trout that was taken from Canterbury’s Lake Selfe with the aid of a Scotty Downrigger while rowing a Porta-Bote. Even five or six meters of extra depth with a downrigger can make a big difference to your catch rate when trolling. Rowing, while harling, or trolling a Cobra, is a very effective fishing method provided you are reasonably fit. If you are not fit after a few spells on the oars you soon will be! Part of the reason for this success is the rowboat’s irregular speed as it makes passage through the water. 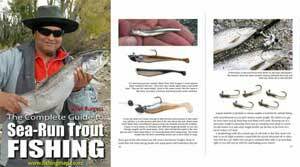 Read more on Trolling for Trout and Salmon with down-riggers and flat-lines. There is a noticeable speed increase on the rower’s power stroke as the boat surges forward, followed by a slowing down as the oars are lifted back for the next stroke. Scotty Lake Troller downrigger clamped to the transom of a 12′ Porta Bote. This stop/start rhythm more closely resembles the swimming action of a small bait fish and so triggers more strikes. The rowboat is also, of course, almost silent as it slides across the water and so doesn’t spook the fish quite as much. The Porta-Bote, incidentally, because of its lightness and excellent hull design is surprisingly easy to row. We securely fastened the Scotty (clamp mount) Lake Troller to the wooden transom by tightening the clamp. Installation should be as close to the stern as possible. Before you start drilling any holes it is a good idea to sit in the rear seat where you intend to operate the down-rigger and consider just how you will work it (to avoid accidents you don’t want to be standing up in a small boat to set your downrigger). Think for a moment about which hand will turn the Lake Troller knob to wind the cannonball up and down, and where will your rod holder be positioned. Your rod holder and down-rigger should be on the same side of your boat. Mount simply because I knew there was a good solid fixing point for it on the Porta-Bote. It was suggested to me that it might be a good idea to fasten the Lake Troller with a lanyard for extra security just in case the clamp should loosen with vibration, but I found this wasn’t necessary. Fishing with a downrigger is always a little odd, to begin with, but like most things become second nature with practice. Let’s assume your mate is rowing. While you are in your seated position close to the transom, let you lure go over the side and let out the fishing line to the desired setback distance. There are two schools of thought on this one: keep the line short; or let out heaps. On a short line, 10-30 feet behind the cannonball fish are inclined to investigate the cannonball, immediately see the following lure and strike! Though not absolutely essential when using a downrigger, a depth sounder/fishfinder will make it both easier to see how deep the fish are and most importantly, water depth. This will not only prevent you from getting your cannonball stuck on the bottom, it will also allow you to follow a lake’s contours and so fish at the best depth along the drop-off. The other school of thought is that a longer setback of 100 feet or more disassociates the lure from the boat and so is more likely to take shy, timid, lure weary fish, particularly in clear water. With your lure now running behind the boat at the required distance, and with only a very light drag setting on your fishing reel, grasp the line a meter or so from the rod tip and then place the rod in your rod holder. 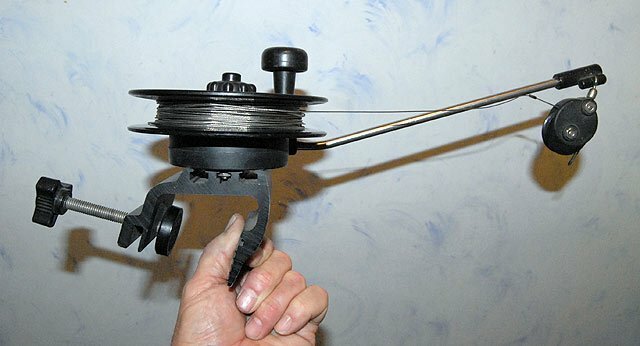 Place the downrigger ball over the side (never drop it over or the sudden jarring stop as it comes to the end of the stainless wire could do serious damage, especially to a small rowboat) and take hold of the pre-set release clip, and pull your fishing line into the clip. Now with one hand firmly on the Scotty Lake Troller spool winding knob, use the other to loosen the drag knob in the centre so you are not winding against the drag. Then, with the drag on your fishing reel backed off to the point where it is just enough to stop an overrun, begin lowering the cannonball, counting the turns as it goes down. At the desired depth tighten the downrigger’s drag knob just enough to stop the weight from dropping. 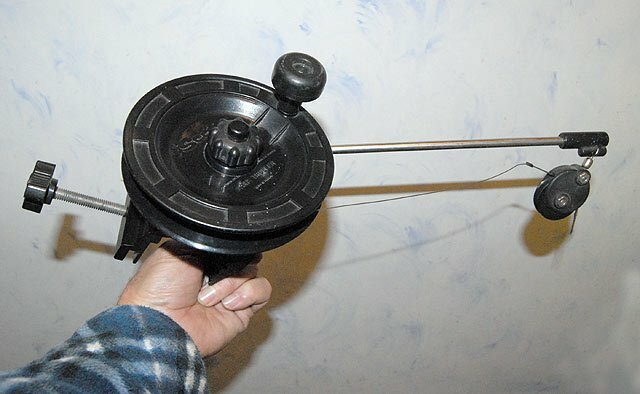 All that remains is to tighten the drag on your fishing reel to what you would consider a fish fighting position, and wind the reel handle to a point where you have a good bend in the rod. This helps to set the hooks, prevents an over-run, and most importantly, a sudden straightening of the rod will alert you to a strike! down. In a shallow lake, it is obviously likely to get snagged! If you use a floating bibbed minnow, such as a Rapala, Crank-bait, Tilsan and the like, it will “wait” on the surface until you are ready! Never tighten the drag on your downrigger more than is necessary to hold the cannonball from falling. This acts as a safety measure should the cannonball or stainless wire become snagged. The most likely cause of which is hitting the bottom in shallow water. If the cannonball does become snagged for any reason it will simply pull more wire off the spool, immediately cut the motor. Then go back around to pull in the opposite direction. Never attempt to pull a cannonball free of a snag with brute force from the motor. In a small boat especially, you could either cause serious damage to the boat or even pull the transom underwater. As an additional extra safety measure always carry a pair of pliers to cut the wire it all else fails. I have three downriggers and have never had to do this yet. But you never know when you might connect up with a sunken log, tree, or rock pinnacle. It is also better not to use your downrigger from a small tinnie in marginal weather conditions, particularly if it is very windy because if you do get the cannonball snagged the wind will make it impossible to stop the boat, and go back safely. It’s worth mentioning that when using your downrigger, as with all trolling, it is essential to keep a good lookout at all times. It is surprisingly easy, even on a very big lake, to be playing about with your lures, downrigger release clip, and so on, and not watch where you are going resulting in a collision, either with another boat or the shoreline! Have fun with the Scotty Lake Troller. 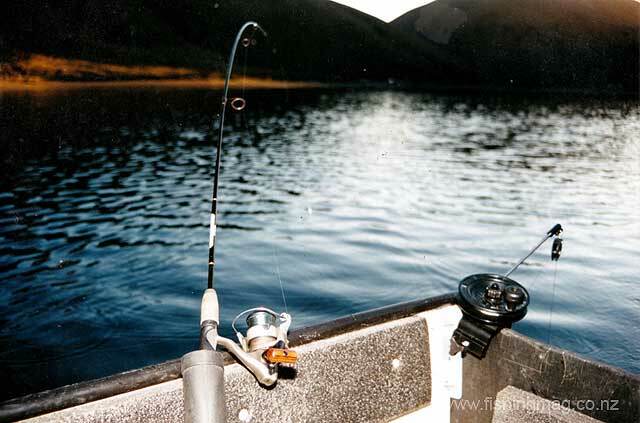 For small boat anglers who like to fish our many delightful South Island lakes, it will add another string to your bow. It can sometimes mean the difference between a fish in the boat and a “fish-less” day! When trolling for trout, and landlocked salmon, with one lure, fished deep on a downrigger, and a second identical lure trolled on a flat line, in my experience the deeper trolled lure is almost always hit first!